Few gaming characters have hung around as long as Donkey Kong, and over the years we at NL towers have garnered a healthy respect for the giant, tie-wearing ape. That's why we decided to throw together a short audio-visual retrospective to take a look at how DK managed to get where he is today. What's your favourite entry from the colossal Kong? Let us know in the comments below. There was so much hype around the release of Donkey Kong Country, and I'll never forget the first time I played it. It literally blew my balls off. Luckily, thanks to Canadian health care, they've since been reattached. I would love to see a new 3D Donkey Kong platformer entry in the style of Donkey Kong 64. I played Super Mario Odyssey for the first time recently (we have serious backlog-itis!) and I couldn't help but imagine what a DK game for Switch featuring beautiful 3D spaces like SMO would be like. The Forgotten Isle level in particular is incredible! Perhaps I'm asking for too much, but personally I'd love to see a developer like Playtonic on board, as their exceptionally English sense of humor brought so much to the Donkey Kong series! Donkey Kong Country 2 is one of my favorite games ever. I like the Retro developed games, but they just aren't the same. Dixie Kong's Double Trouble is my all-time favorite. I really hope we get Donkey Kong arcade on Switch. In the 1st Donkey Kong game he was a bad guy. In the 2nd game he was the good guy and Jump man (Mario) was the bad guy. Nintendo had no clue on how to build brand identity. Then they got sued by Universal Studio for infringement of King Kong's copyright, but it was later discovered that Universal Studio didn't owned King Kong, it's in the public domain... so Universal had to compensate Nintendo for all the legal cost (what a bunch of idiots). I hope the Donkey Kong arcade games come to Switch! @Nincompoop Universal believed the threat of litigation would scare a then up-and-coming video game company like Nintendo enough to C&D or settle out of court; a classic case of a Goliath conglomerate using its brand and reputation to impede a fledgling company just because they could. Universal's embarrassing failure in this case to prove Nintendo was infringing on the rights to a public domain property they did not own is what many believe gave Nintendo the confidence to conquer the North American market. Great stuff, all around! DKC2 is my favorite game of all time and no other 2D platformer even comes close to being as amazing except maybe Yoshi’s Island or Tropical Freeze. I want it on Switch, Nintendo! Also, I want a new 3D DK game after playing Odyssey. DK64 was underrated and DK deserves another shot at 3D platforming. Am I the only one that loved Jungle Beat played with the bongos? I desperately want a sequel. Tropical Freeze is gonna be so cool! You completely overlooked the "Mario VS Donkey Kong" series. It's a shame : these games are amazing ! Espacially the GBA iteration. I remember when the DKC first came out, I didn't have a SNES (I did have DK 94 on GB) and was so fascinated by COMPUTER 3D MODELING (GamePro feature education) that'd I'd sit and draw "wire frames" of the characters then try to draw and color on top of them, for hours. Excited for this game. I was thinking the exact same thing. We already got Mario Bros. & SMB, so DK should be coming at some point. That will def. require our own King of Kong Arcade Challenge. @AlexOlney A video on the history of Donkey Kong and you passed up the opportunity to make fun of Billy Mitchell? Shame! Never any love for DKC3. I freakin’ love that game. Yes, Kiddy Kong is not great, but I was never a big fan of Dixie so I got used to him. And man those backgrounds were beautiful. I am always ready to play that game. Donkey Kong is a timeless character with unforgettable games. I still go back and play the old school games on the NES & even on the Game & Watch systems. If art is meant to stand the test of time, Donkey Kong, over any other Nintendo character, can stand proudly as the King of Kings at Nintendo, even if Mario & Link get much higher praise. Donkey Kong country 3 is my favorite. I need it on Switch. The snes trilogie on Switch would be awesome!!! Donkey Kong Country Returns is pretty fabulous to me. I don't think I could ever pick a favorite though. They all have a special place in my heart and different strengths. The one with my fondest memories would be Donkey Kong 64 though. So many great times when I was around ten. @Kwehst Same exact feeling here. Man, you're not alone. DKC3 is my favorite too. “Evolution” is a generous phrase to describe DK. There really hasn’t been a whole lot of change between DKC and Tropical Freeze. DK could really use a breath of fresh air TBH. And not a sandbox platformer either, there’s no need for every 3D platformer to jump on that bandwagon. I love Donkey Kong, Tropical Freeze is a masterpiece I really hope it reaches an even bigger audience on Switch! I remember my brother buying me Mario Vs. Donkey Kong on GBA, I was really impressed how good it was. "There was so much hype around the release of Donkey Kong Country, and I'll never forget the first time I played it. It literally blew my balls off. Luckily, thanks to Canadian health care, they've since been reattached." Hmm, what about the Donkey Kong Country cartoon series by DIC? Or should I never mention it? Seeing my neighbour in the hospital play Donkey Kong Land on his Game Boy in 1994 was making me want to be a gamer and a few weeks later I got a Game Boy with Jungle Book and Tetris, I was 4 years old back then. Jungle Beat is one of my favourite 2D platformers. And somehow the bongos just... worked. Maybe that says less about my taste in platformers and more about my fondness for smacking things, but I think it's a really great game. @Majora101 I made a point to ALWAYS wear the Diddy Kong costume in that level. He was not my favorite in the arcades but he is worth a look now. Also, this video sells Jungle Beat and the first Mario vs Donkey Kong short. I get it though, Country is where it's at. Oh, and David Wise and Eveline Fisher didn't return for Returns. David Wise was back on Tropical Freeze though. That was a great video. Thank you. I remember when Donkey Kong first arrived in arcades. I absolutely loved it. I was beyond excited that it also came packed in and arrived first on the ColecoVision home console. When I was 13 I would play that game nonstop just rolling the score over. Feeling a bit nostalgic, think I might download this to my Wii U. @Bolt_Strike Small changes over a long time is literally the definition of evolution. @AlexOlney Not in this context. Within a technological perspective evolution is seen as quicker and more drastic. Ideally there should be gameplay changes every generation. There's barely been any for DK over the course of 5 console generations. It's really kind of ironic. 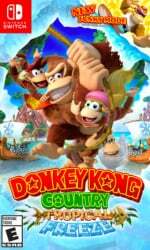 People complain about games like NSMB and the recent Kirby games not really changing much from game to game, but what has DK done like, ever? I like all the dk games. I wish they would bring arcade dk and dk jr to arcade archives. How can a chimpanzee be related to an ape? I need to echo samuelvictor and Sakisa here: Donkey Kong Country is nice and all, but its main innovations and strengths were in graphics rather than gameplay (in which department it was very comparable to other platformers of the time). The Game Boy and GameCube entries, by contrast, were more original, fun, influential and clever, and hold up better as experiences worth seeking out in 2018. Donkey Kong '94 tricks you into thinking it's a remake of the arcade game, before turning into a full-fledged puzzle-platformer and providing some real mental challenges. The fact that it's starting from a setup that everyone knows eases you into the challenge, and then it layers in new elements slowly, like picking things up a la Super Mario Bros. 2, conveyor belts, and what I believe is the first appearances of Mario's backflips, until it becomes very challenging indeed both as a platformer and as a puzzle game. This game inspired not only the very good Mario vs. Donkey Kong sequel, but also other puzzle-platformers like the excellent GBA Klonoa games. Donkey Kong: Jungle Beat, meanwhile, was the first creation of Nintendo's EAD Tokyo team, and was so utterly fantastic and fresh that Nintendo promptly handed the team the keys to the Super Mario series (with the exception of the inferior "New" line), where these experts at platforming have continued to excel. What makes Jungle Beat a breath of fresh air is that unlike Donkey Kong Country and just about any other platformer you could name, you've never played anything like it before. It's a brand new kind of control - hitting two drums, where the speed of drumming controls the speed of your movement - executed so skillfully and inventively you'd think it was a long and storied tradition. The combo system rewards risky play, and the game shines most in particular levels where (if you're good enough) you can chain together moves so much that you can get through the whole thing without ever touching the ground. @buxner DKC2 and Tropical Freeze are some of the most finely crafted 2D platformers out there honestly, and I think people sell short the amount of craft that went into those, especially Tropical Freeze when they say it was a waste of Retro's talent. That said, yes, Jungle Beat and Donkey Kong '94 slip through the cracks far too often. Jungle Beat especially gets lumped in with Konga a lot, which is certainly not fair to it. @Sakisa Fair enough, and sorry for bringing your name into it when the only part I was agreeing with you on was those games being underappreciated. I've only played DKC through and a little bit of DKC3 and DKCR (neither of which held my attention enough to finish them). Shame I missed DKC2, if that was the better one. With that said, when I have the money to buy a Switch Tropical Freeze is definitely on my list of games to buy.